Jean Luc comes from the classical school Cadre Noir of Samour in France. The classical theory is based of what riders thought a long time ago, and what has become the tradition in riding. But new science has shown that many of these theories are not correct! One example is the swinging back. Our ancestors were not wrong. They were good riders, but they explained what they felt in riding according to that times knowledge. And since we now has more knowledge we need to question the classical theories. Jean Luc is now going through several dressage movements, for example half pass and piaffe. 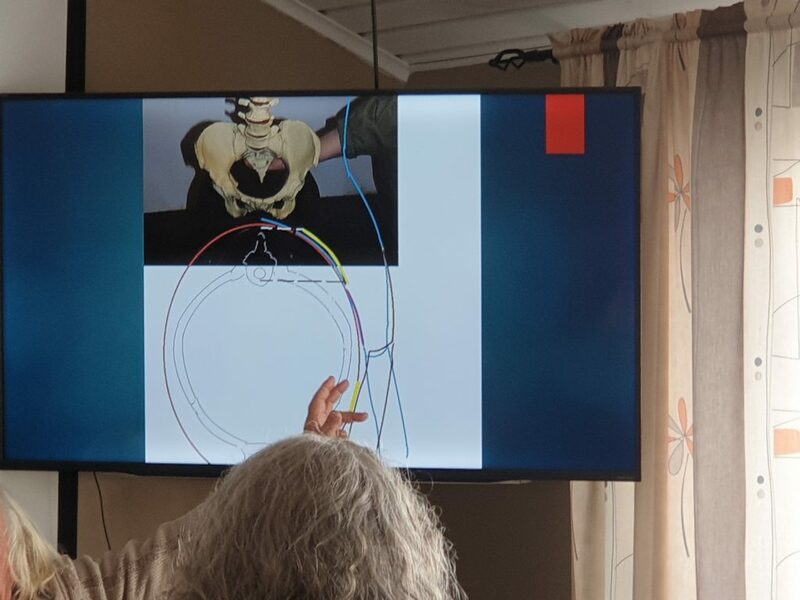 For each movement he is comparing the classical explanation of that movement with todays knowledge according to science. This shows how wrong the classical masters really were. If we keep on following the theories of the classical masters, we will ride our horses wrong. The principle of training have been obedience. That is completely wrong. Horses wants to work with us. They only need the guidance to do it correct. 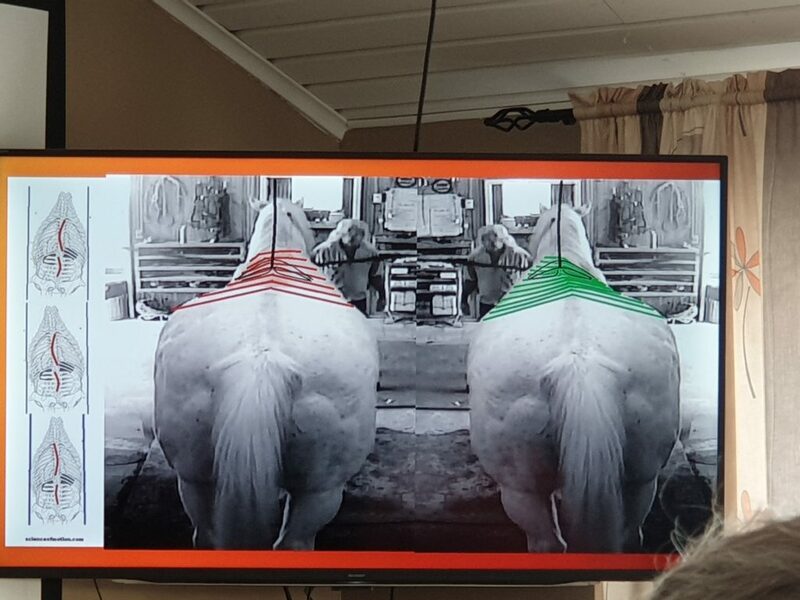 You need to teach the horse to move in a way where they use more eccentric contraction (instead of concentric contraction) and elastic strain energy. Then the horse can work with less effort. When the horse feels this he will start to search for that movement. The problem is that all horses protect their tensions and the way they are used to move. Every horse will protect their problems. Therefore all horses will make misstakes. You need to analyse the misstakes and guide the horse to find a solution in the right direction. Submission will not solve this. Instead we need to encourage them to try a new solution. 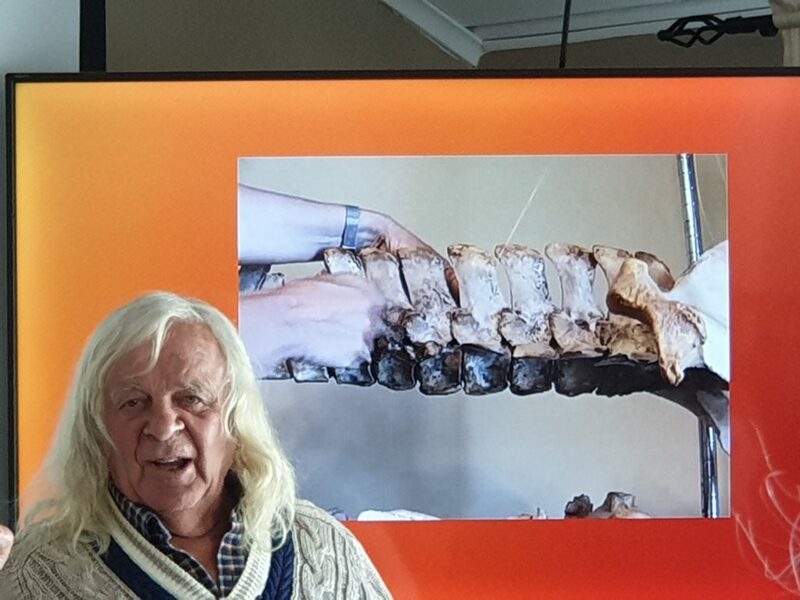 In 1964 the first study was made about the vertebra column of the horse. 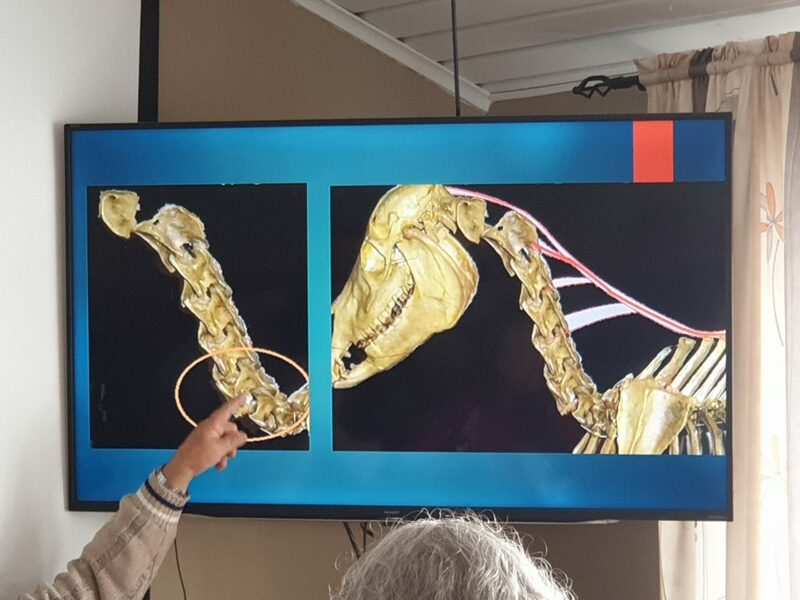 It shows that the thrust from the hind legs will travel thru the spine, vertebra by vertebra, and the back muscles can convert that into an horisontal and an upward force. That study did not get much attention. By this time, the general opinion was that the bow and string concept was correct. That means that the muscles in the upper line should be suppled to allow to be lengthened by activating the abdominal muscles. ”I think it is evident now that in certain respects the first approach to the physics of cosmical plasmas has been a failure. 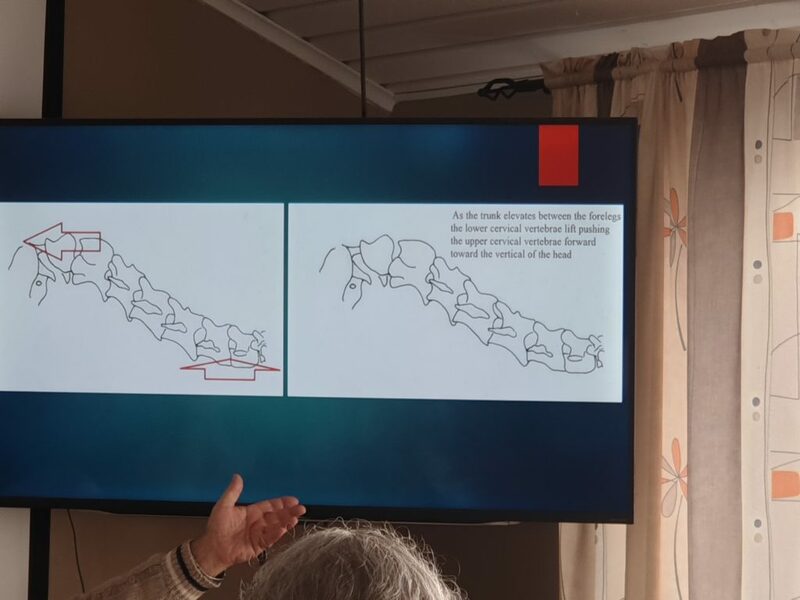 It turns out that in several important cases this approach has not given even a first approximation to truth but led into dead-end streets from which we now have to turn back.” (Greg Hummel 1970) In the same way we need to turn our back to equine classical theories, such as the bow and string concept, driving with the seat etc. These theories are wrong. That is not the way it works. In space research, the magnetosphere and interplanetary space, which are near the Earth, where supposed to be void and structureless. We know now that they are filled with plasmas and magnetic fields. 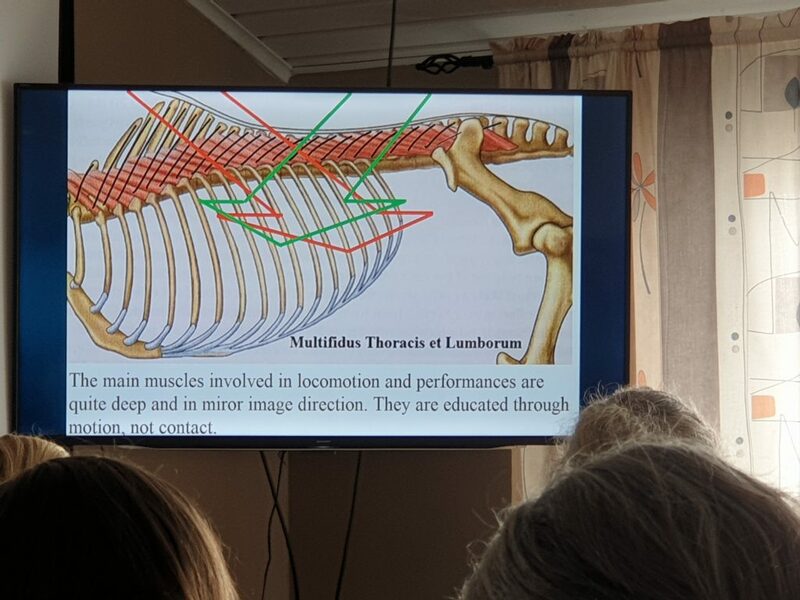 As well, we know now that the thoracolumbar spine is not a set ot tendons and ligaments kept under tension by the string. 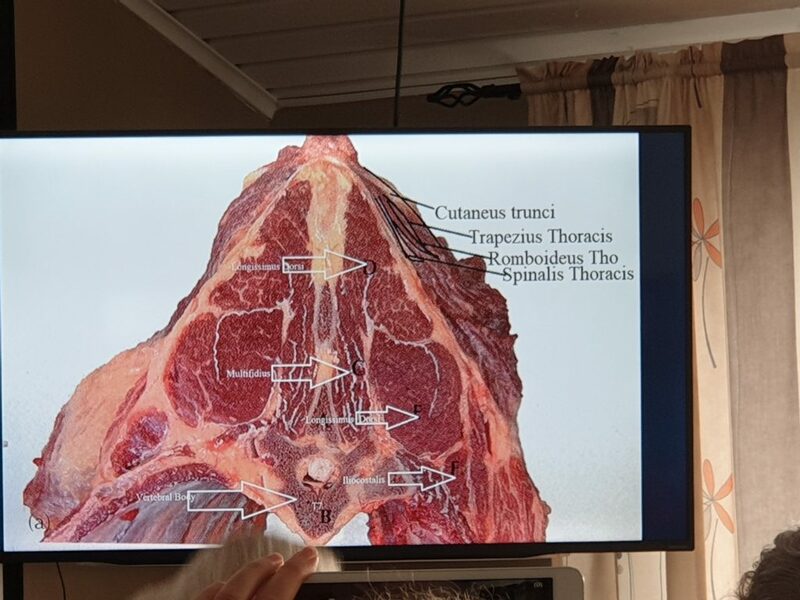 Instead, the equine thoracolumbar spine is a complicated network of muscles, tendons and fascia, functioning differently than previously believed. Tensegrity, elastic energy, forces transport, closed kinematic chains are the new words of classical equitation. They are the fundamental components of equine gaits and athletic performances. They cannot be forced, submitted or disciplined. They can be processed in the horse brain, through a dialogue upgraded to the very high and very refined horse perception. In tempi change the horse does not engage the hind legs much. The hind legs does not go in front of the vertical. Instead the tempi change helps the horse to store more elastic energy. In the right canter the left side resist and store elastic energy and vice verse. You need to ask for the first two changes, then you should just sit without moving and the horse will use the elastic energy to repeat the changes. Every time a hind leg push it will create an oblique force working on the vertebra column. The muscles must resist this force. The whole horse is built in the same way. 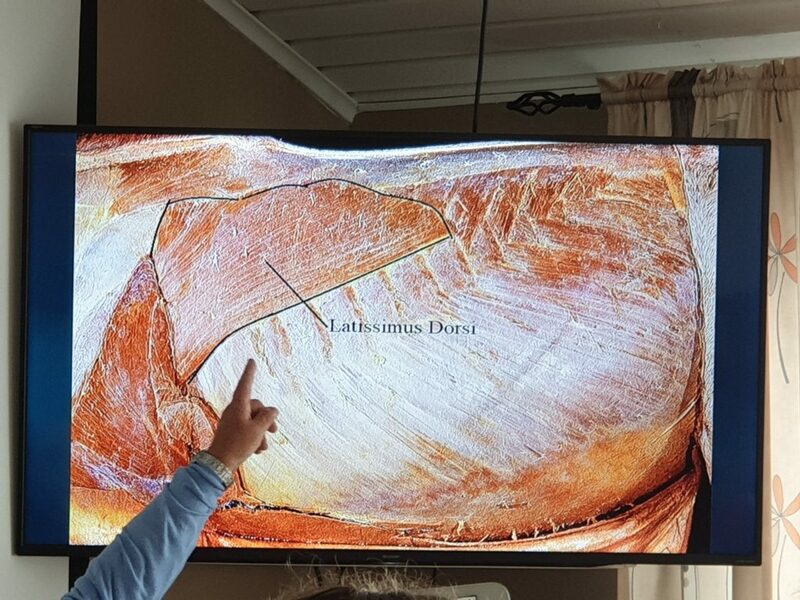 In the legs all the joints have tendons and muscles that need to resist the impact force when the horse is moving, other ways the impact force will damage the joint. To stay sound the horse need a certain muscle tone. Therefore supplement is not the solution. There is no such thing as straightness in the horse. When the horse is moving there are always a slight bending to the left and to the right, that causes the shoulders and the hind legs to move a little sideways. Straightness means making these sideways movements smaller and to narrow the corridor. 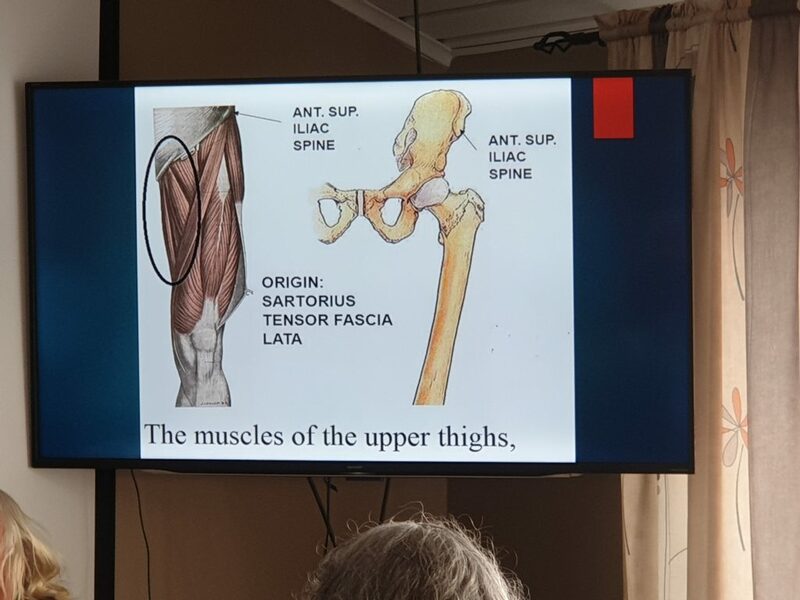 With your back muscles and your upper thigh you control the shoulders of the horse and with your calfs you control the hind legs of the horse. The perception of the horse is very high. Therefore you should never squeeze with your calfs. The stirrups helps you to hold your calfs in the right position. You only need to touch the horse gently, you don’t need any force. And you should never squeeze with your thighs. You should place your thighs in balance on the horse. But the horse need to be able to widen the chest, and that is impossible if the rider is squeezing. Flexion creates a small movement between the vertebras. So does the bending and the rotation. The movements are not exactly the same, but they are very similar. And they are created with the same muscles. Therefore flexion will make bending and rotation easier. And bending and rotation will make flexion easier. The push from the hind leg creates a force. That force need to be channelled by the rider and the horse. When the right hind leg push the force goes diagonally to the left. 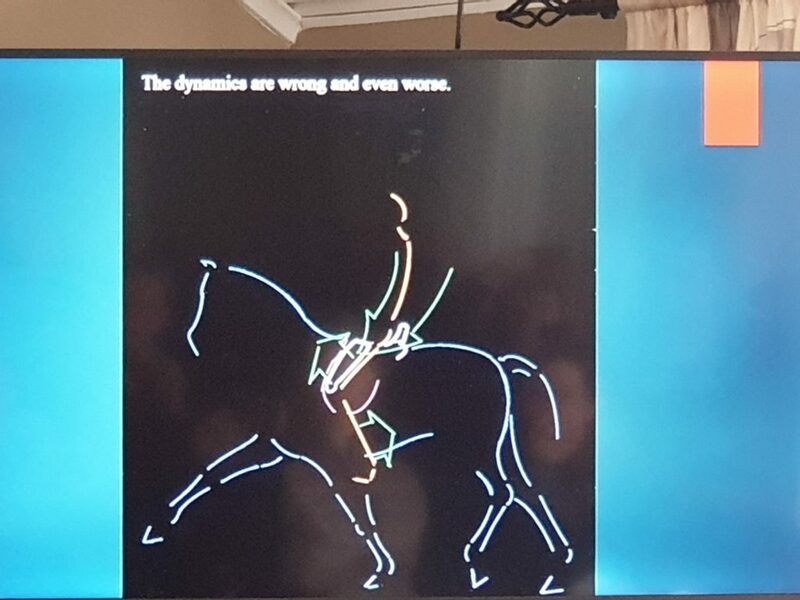 If the rider follow that force to the left the horse will follow and rotate to the left. Instead the rider should resist that force and stay balanced in the middle. Therefore the rider need to create a corridor with it’s back muscles, it’s seat, thighs and calfs. The whole body of the rider will be involved to guide the force in the right direction. This is a constant dialog with the horse. The force will be changed every half second, and therefore also the riders muscle tone need to change every half second. Therefore a good posture can’t do this work. It must be a constant dialog. 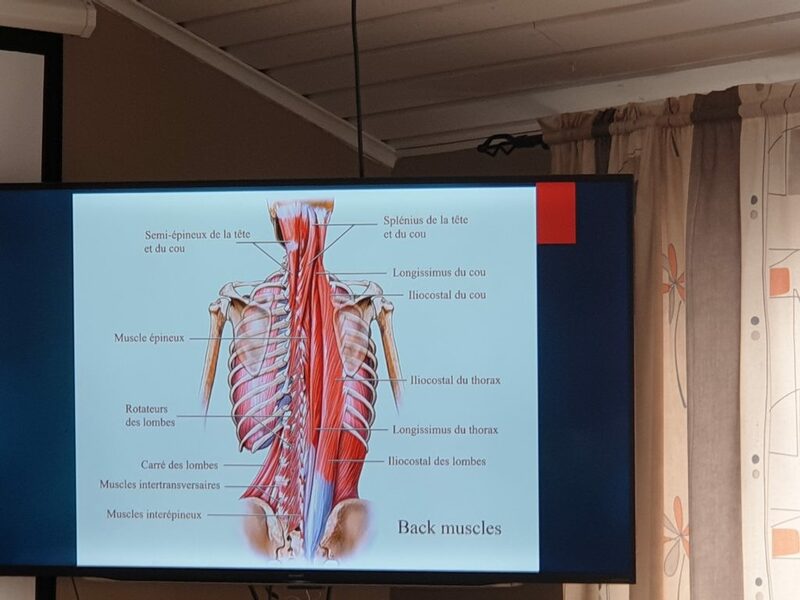 Stabilising system of the vertebral column during movements. ”The reflex contraction of the spinal column muscles compensate for the bending of the spinal column” (Ober J. K. 1974). 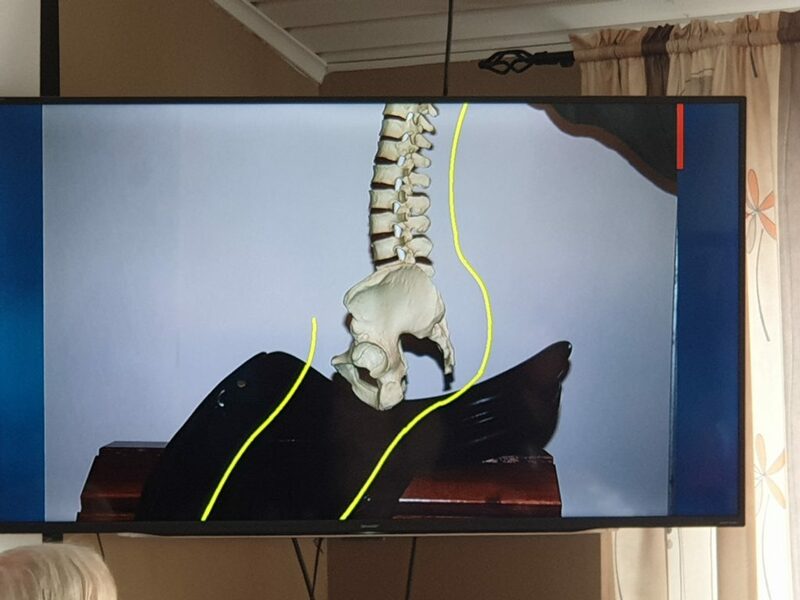 This is a characteristic behaviour of the spine stabilising system during movements. The findings contradict theories pretending that lateral bending stretches the muscles situated on the outside of the bend. 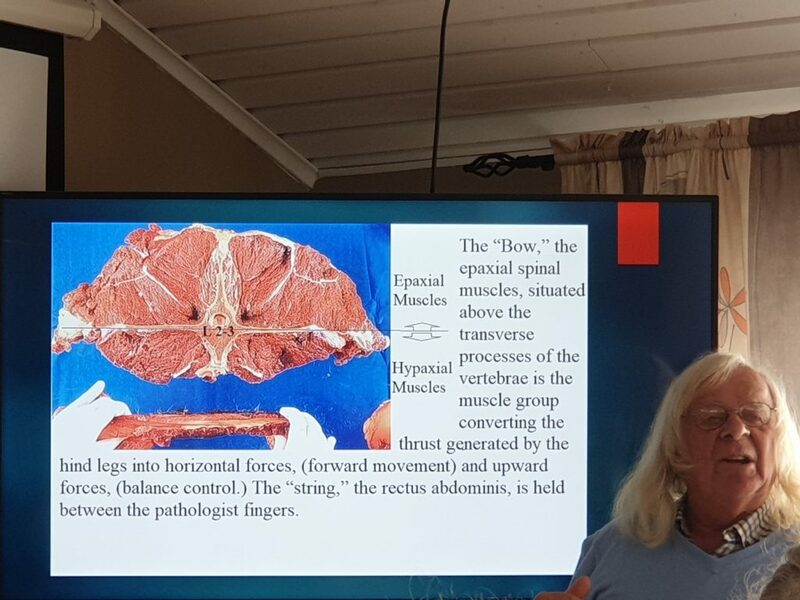 Dr. Betsy Uhl DVM, PhD, DAVCP explains how the force generated by the propulsive hind leg acts obliquely on the thoracolumbar spine. The thrust generated by the hind leg has to be resisted by the muscles situated on the opposite side of the spine to create movement. The same principle applies to lateral bendin. If the horse go faster than a certain frequency the horse will not be able to store enough elastic energy to create an upward push. Therefore with a slower frequency will make it possible for the horse to create greater movements. When you sit on the horse you are always on the two seat bones, the glute and the upper thighs. Both your posture and your muscle tone will differ thou, depending on which muscles you engage. 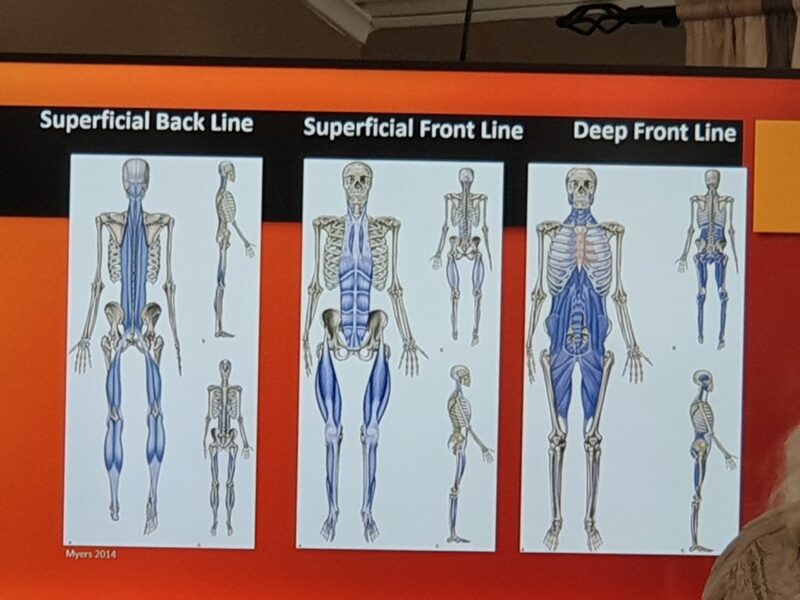 Simplified we can say that the superficial muscles are responsible for creating movements in your body and the deep muscles are responsible for posture and change in muscle tone. To be able to get a neutral seat you need to learn how to engage your deep muscles. Then you can start to play with making changes in muscle tone, to tone up with your horse and get the same tensegrity. Saddle makers tried to improve the look by pushing the glutes forward with high cantle and keeping the thighs in place with oversized thigh blocks. They improved the look but not the function. The rider’s body weight acts from back to front hampering proper function of the horse’s back muscles and increasing the load on the forelegs. The thighs push upward in the oversized blocks. 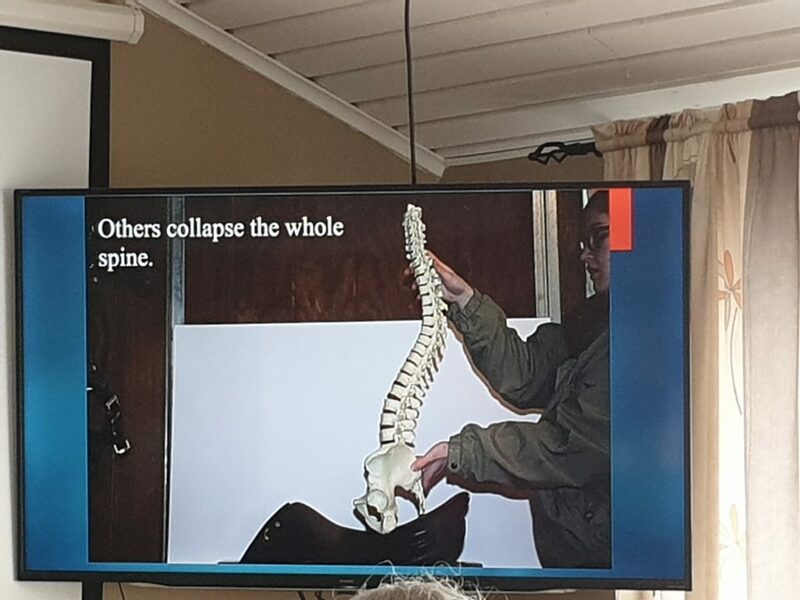 Also resulting from slackness of the glutes and artificial support of the high cantle, some riders collapse the vertebral column rounding the whole spine. Some riders collapse even further, lifting the upper thighs in the oversized thighs blocks, bending the knees and losing stability of the lower legs. The legs instability creates chaotic stimuli in the horse’s side, where the horse does have a very high tactile perception. If the glute are not strong enough, the result is that the rider has a posture that looks alright, but it is working in the wrong way. If the body weight is acting back to front, the body weight alter the function of the back muscles. That creates the wrong dynamic. A saddle that place the rider don’t allow good riding. Instead the saddle should allow the rider to find the right place. The stability of the rider’s seat is based on the tone of the glutes, psoas and other muscles, and therefore, a saddle allowing such tone. If the weight is too much forward, the horse will shift backward – down (the front legs are pushed backward down). If the weight is too much backward, it pushes the horse forward – down. Do not push your heels down, since that pushes your weight back. The vertical line of the rider is the key. Body weight can act consciously or not, the horse responds anyway. Precise position gives you the ability to orchestrate the horse. You should never act back to front or front to back. To manage this you must place yourself in a totally vertical position. As you can see it is mostly the same muscles that the rider uses in the neutral seat as in the classical seat, but the posture is not exactly the same. You have to advance your pelvis. 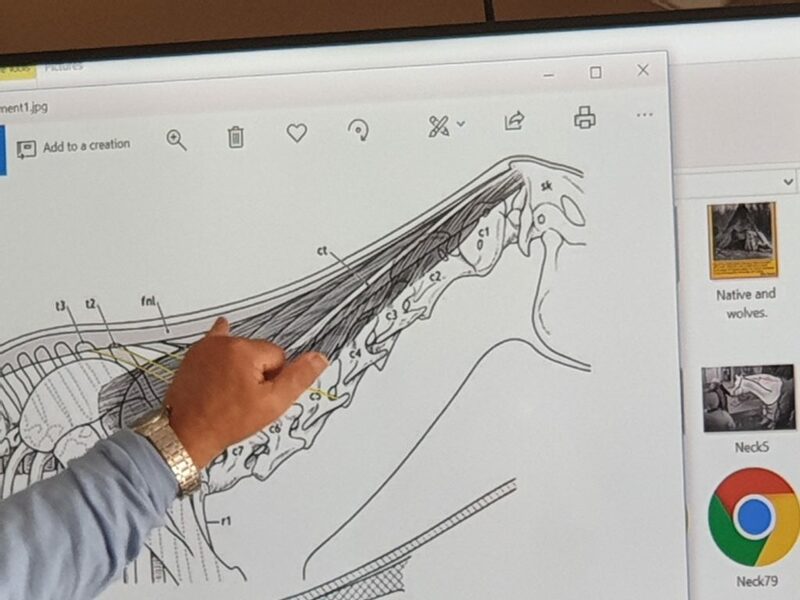 Properly tuned, the whole muscular system allows a neural balance where the front part of the shoulders, the middle of the spine, the seat bones and the stirrups are on the same vertical line. The rider can then orchestrate the horse’s subtle nuances in muscle tone. 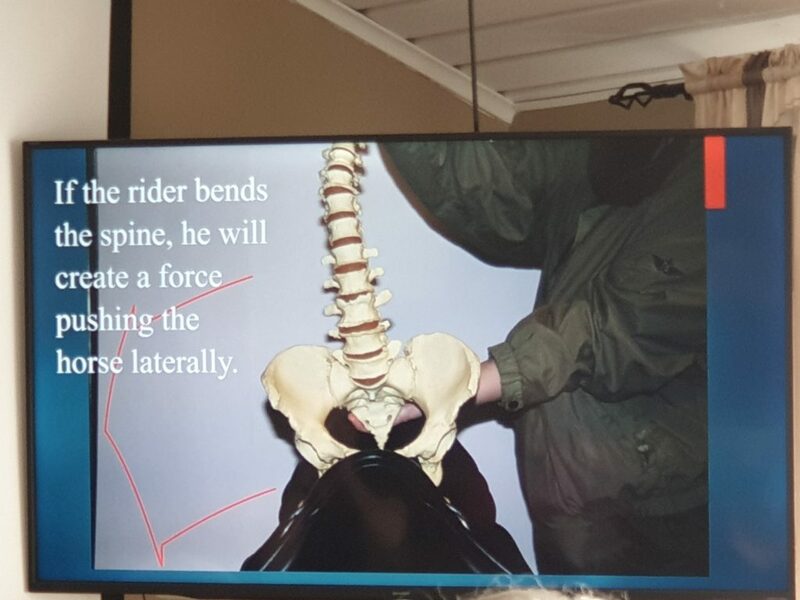 The middle of the spine is the center of the rider’s rotation. It is exactly between the last thoracic vertebra and the first lumbar vertebra. If any of these points are in front of or behind the line, you will disturb the balance between the diagonally back muscles in the horse. We must figure out how the horse’s body must be shaped to be able to perform the movement. The art of riding is to educate and coordinate the horse’s physique for the athletic demand of the performance. To make the horse perform different movements are not the difficult thing. The difficult thing is to coordinate the muscles of the horse in the right way to be able to do the movements in the correct way. Without this coordination, the movements will create strain on the horse and eventually the horse will be injured. The horse obey to the aids we are using. Instead of giving aids we should just change the tone. Act like you are moving, but don’t move. Only change the tone in your muscles. To be able to do this you need to explore your own body. The tensegrity of the rider must match the tensegrity of the horse. If it matches the horse will react. Therefore the horse will give the rider feed back and tell the rider when the seat is correct. If you change the tone of your body and the horse does not respond, analyse the reason. Maybe you are in front of or behind the neutral posture. Or maybe something else is disturbing the energy floating thru the rider into the horse. Even if you have what looks like the right posture, it doesn’t have to be correct. In this posture there are gradations. Every rider need to find the level of precision of body control to be able to play with these gradations. Yes, it is subtle and gentle, but it is possible to do. We are usually told that the saddle should be placed behind the Trapezius muscle. 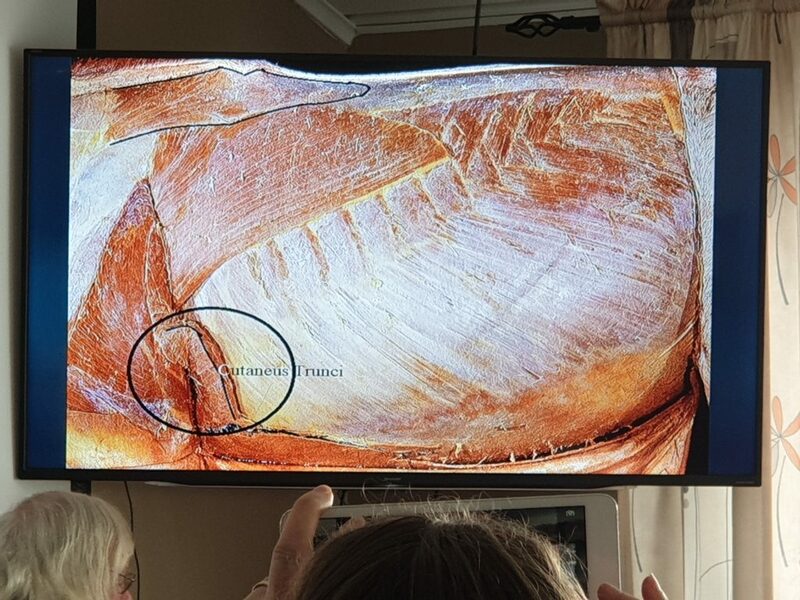 But if you remove the top layer of muscles you will see that the trapezius goes far back on the horse. So does the latissimus dorsi. You can’t place the saddle that far behind. You need to remove 4 layers of muscles before you reach the muscles that coordinates the spine. Therefore these muscles are not activated by pressure, instead they are activated by movement. 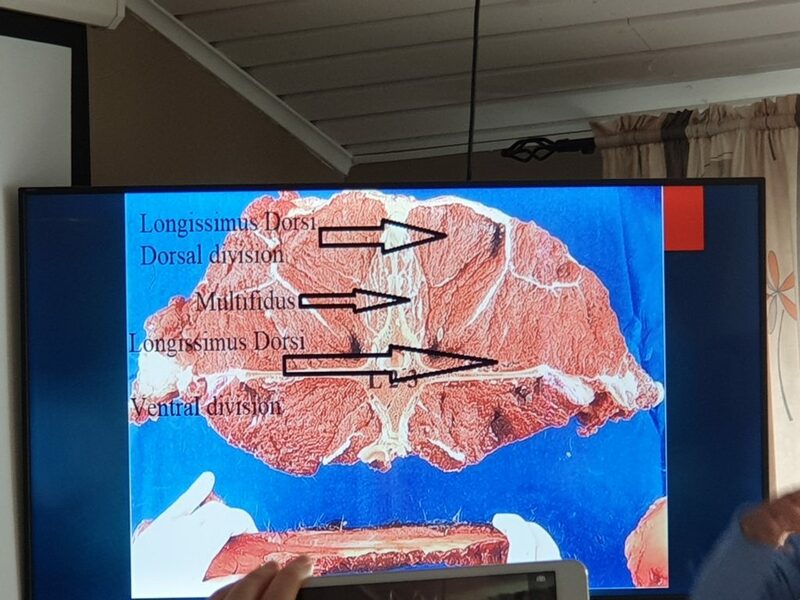 There are actually two different longissimus muscles, it is on dorsal muscle and one ventral muscle. These together with the multifidus muscle are protecting and stabilising the horse’s spine. 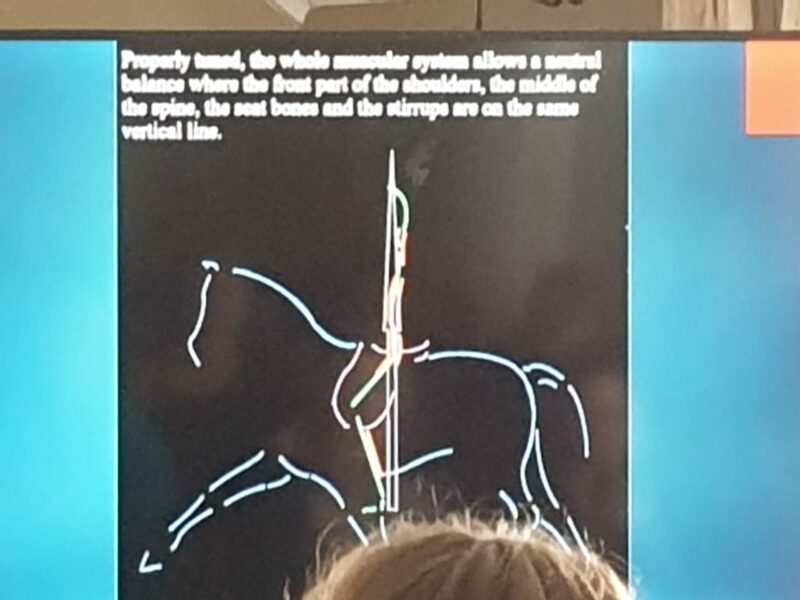 This system of diagonally muscles makes a complex coordination of the horse’s back and are able to convert the forward thrust into an upward force and an horisontal force. When this coordination is working you will feel it. If it is not working, you must find out how to help the horse to find a better way to coordinate the back muscles. If there is a disturbance (such as a seat working back to front or a hand restricting the neck), the horse will protect himself and resist. 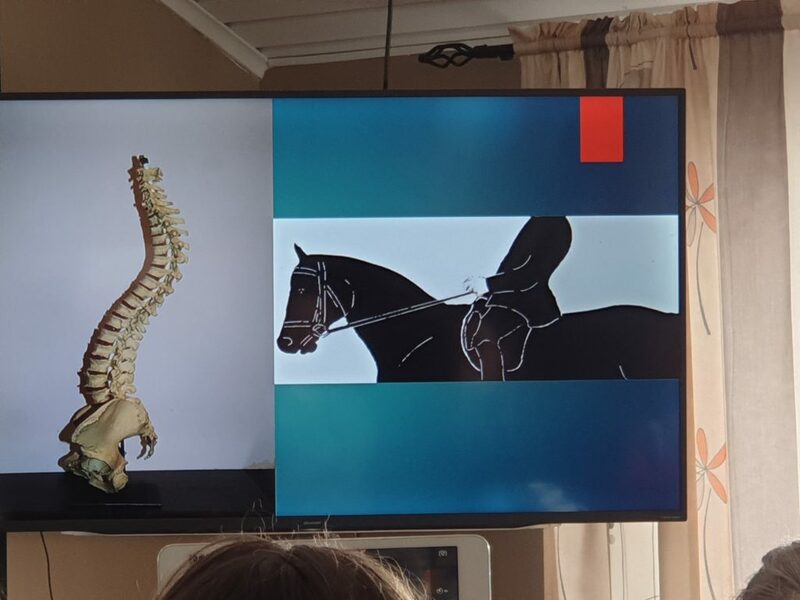 If you follow the movements that the legs of the horse is creating, you will move more than the spine is created to move. Then the horse need to protect himself from the movements of the rider. Instead the rider need to minimise the movements in the rider’s body to match the movements in the horse’s back. This creates an equitation where the rider barely move. Then it will be possible for the horse to react of gradations of muscle tone in the rider. It is not the muscles that move the leg. The muscles create tension on the tendons and the tendons move the leg. Therefore you always need to prepare the horse and give the horse time to coordinate the body in the right way. When the body is ready the horse can perform the transition. It is one cm in difference between the seat bones for a woman and a man. The pelvis of the woman (left) is wider, but most men are bigger than women. Therefore the different is so small. You need to be in the middle of the saddle. You should place yourself on top of your seat bones. There will always be a curvature in the spine, but it should be almost straight. If you collapse the S-shape will be too big and the center of the spine will be behind the seat bones. The movements in the spine will also be too large. With too much S-shape the interior part of the disc will be compressed. The fascia should separate the vertebras in the spine. But with an exceeded S-shape in the spine, the fascia will not function properly. If you want to get a reaction from the horse by increasing the tone of your muscles and you don’t get that reaction. Don’t continue to do the same thing. Change a little. Do more, do less, change the posture, use the tone in different muscles etc. But don’t expect to get a different reaction by continuing doing the same thing. If you succeed, you are going to get more and more results by doing less and less. The seat bones are two points around which the pelvis can oscillate back to front and front to back. 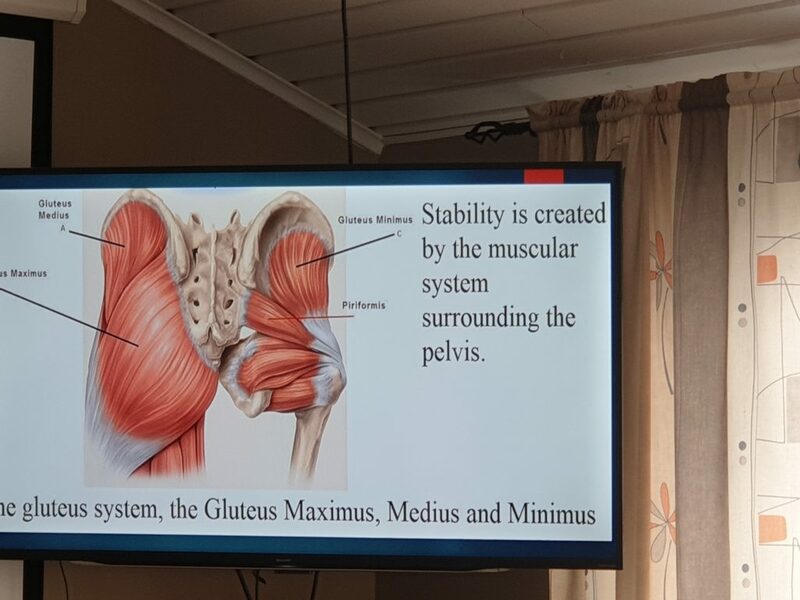 The gluteus muscles should not be contracted, but not totally relaxed. You need some tone in the gluteus. If the rider does not resist enough with the gluteus the rider will fall backwards. If we contract it a little it will help us to become straight. If we contract it too much the back will become arched. 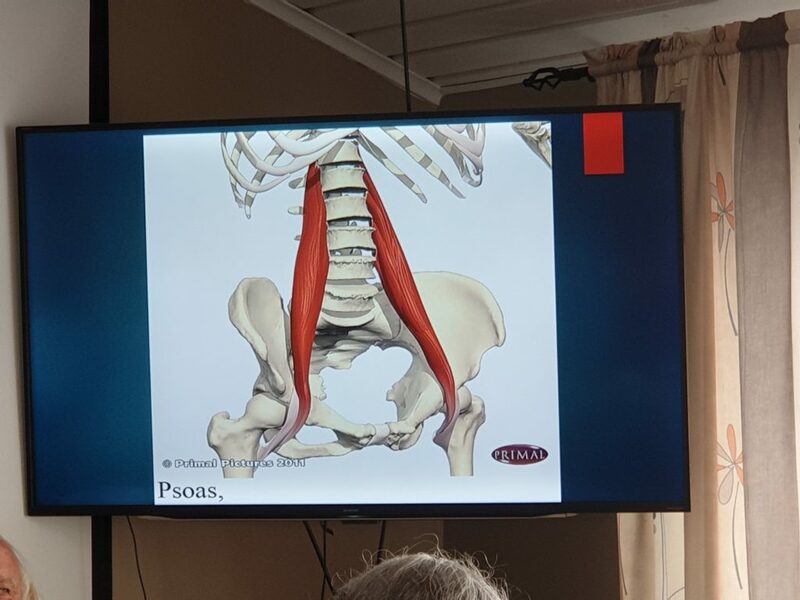 You should advance the Anterious Superius Iliac Spine (ASIS) forward. This will keep the rider’s seat forward in the saddle without tilting the pelvis forward and arching the back. 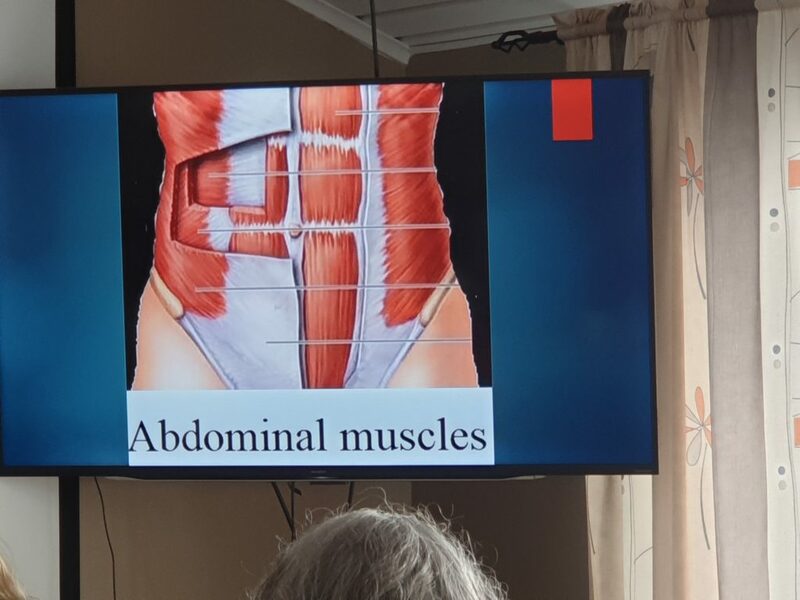 Everything we do with the abdominal muscles must also be done with the back muscles. You always need to find a balance between the front and the back. 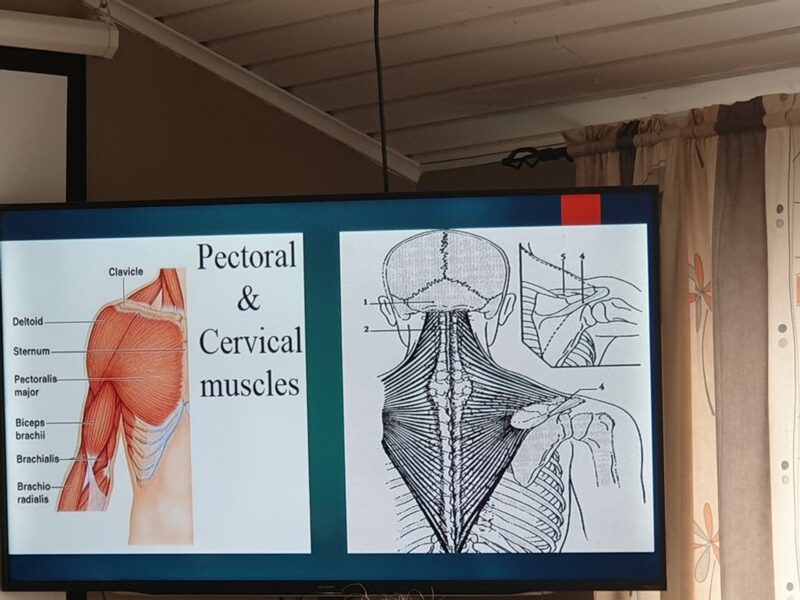 You will never function properly in the thoracic area if the cervical muscles are not engaged properly. In many instances, riders sit further back on the saddle (behind the middle). There are also a lot of saddles that place the rider to far backwards. This will increase the back to front effect. Even if the rider is supported by high cantle and oversized thigh blocks, the body weight is acting back to front when the rider sit to far back. Arching the lumbar spine and shifting the shoulders back. This put strain on the vertebra discs. 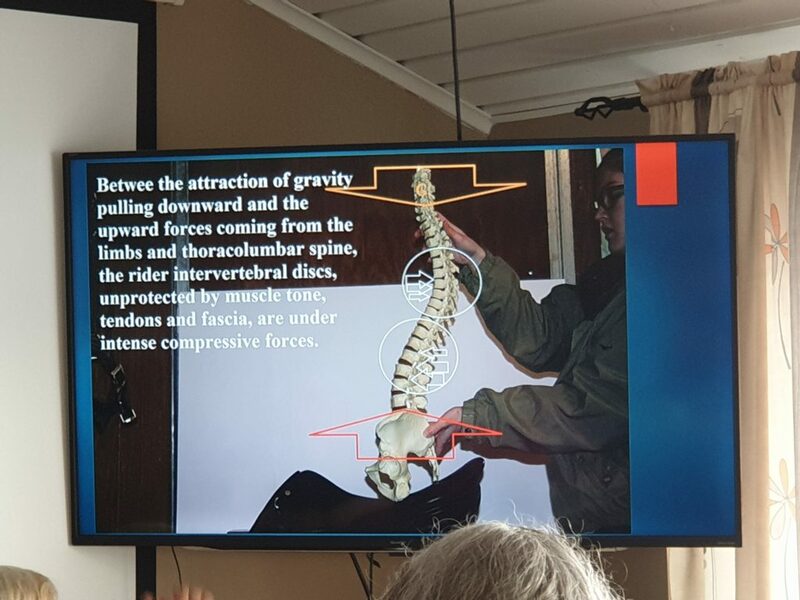 Between the attraction of gravity pulling downward and the upward forces coming from the limbs and thoracolumbar spine, the rider intervertebral discs, if unprotected by muscle tone, tendons and fascia, are under intense compressive forces. 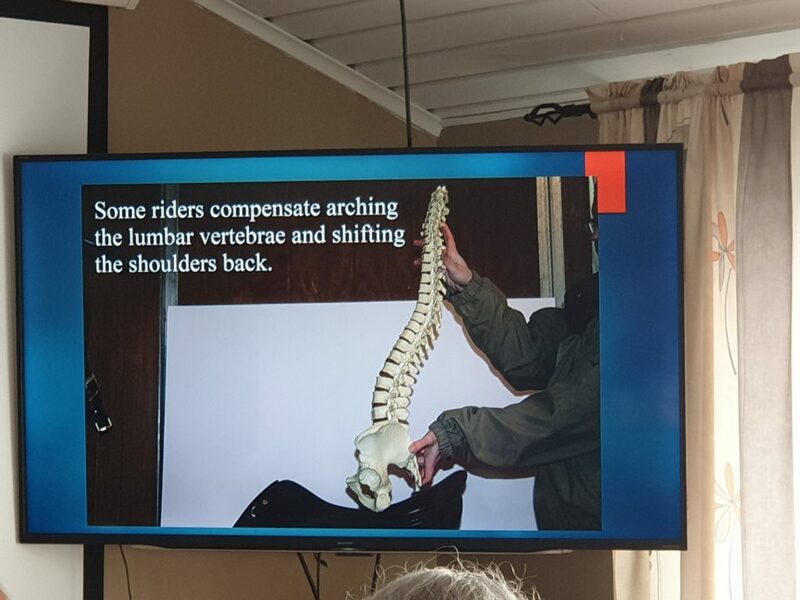 This is the reason that many riders get back problems. The fascia are supposed to separate the vertebras, which will take the strain away from the discs. Therefore we need a certain tone. This seat with an arched lumbar spine and the shoulders back or a total collapse of the whole spine is the hardest falt in the seat to correct. The rider are probably not aware of the problem. It’s a seat where the rider does not use any effort. The rider need to learn to become taller and start to use more muscle tone. 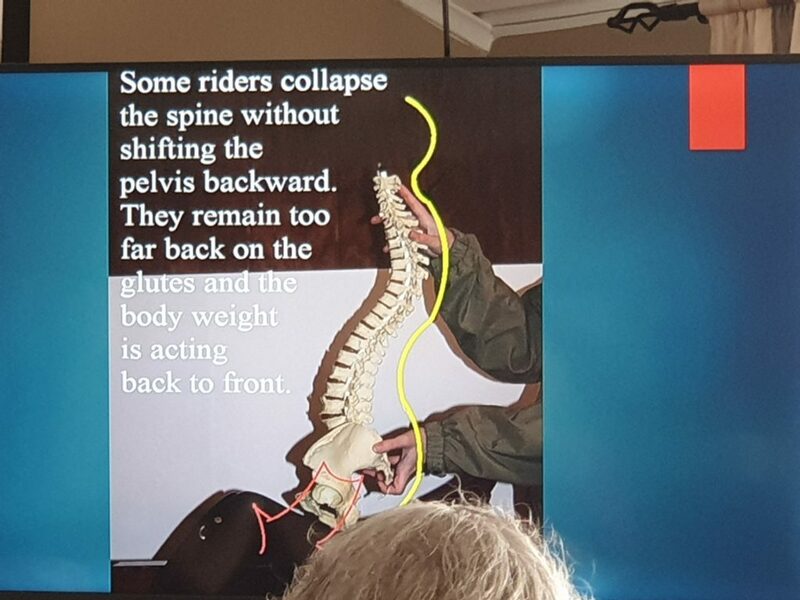 Some riders collapse the spine without shifting the pelvis backward. They remain too far back on the glutes and the body weight is acting back to front. 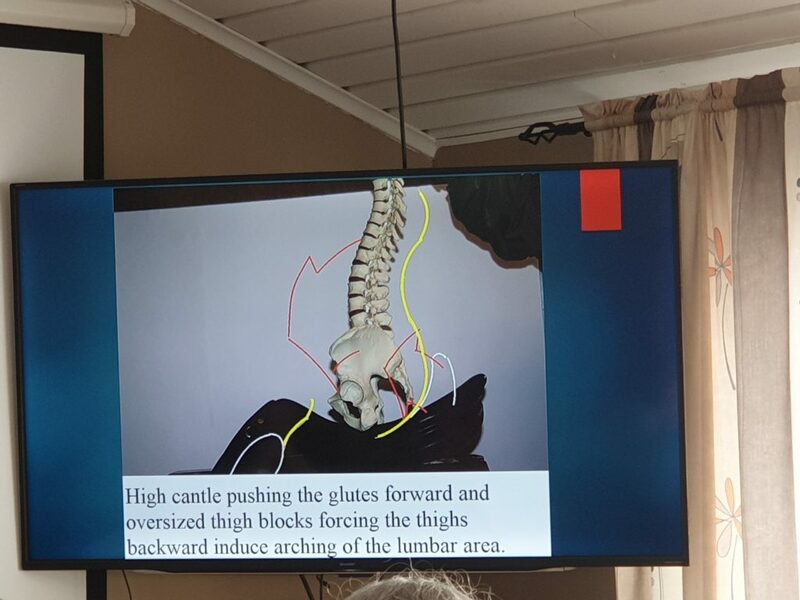 High cantle pushing the glutes forward and oversized thigh blocks forcing the thighs backward induce arching of the lumbar area. A lot of the problem we have in our horses is caused from the fact that we does not sit on the right place. Therefore we create a force that the horse act on. Then we need to compensate that with more reins and legs. The only way to get lightness is to always ride with loose reins and with neutral seat. We don’t have to be perfect in our bodies. But we need to find a seat where we are neutral to the horse. Therefore every rider have to find its own way to become neutral. Therefore different riders might need different muscle tone, and different riders need to engage different muscles. It is not the posture that is important. It is the coordination. It doesn’t have to look a certain way. It has to be effective. 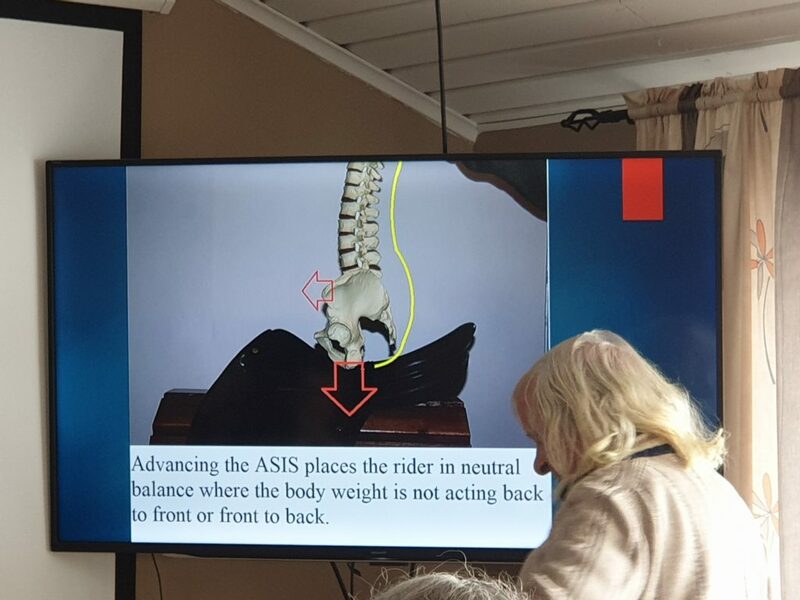 Advancing the ASIS places the rider in neutral balance where the body weight is not acting back to front or front to back. The best way to do this (especially for women) without arching is to advance the ASIS together with the sternum (open the chest). Harmonic tensegrity occurs at the level of biotensegrity. 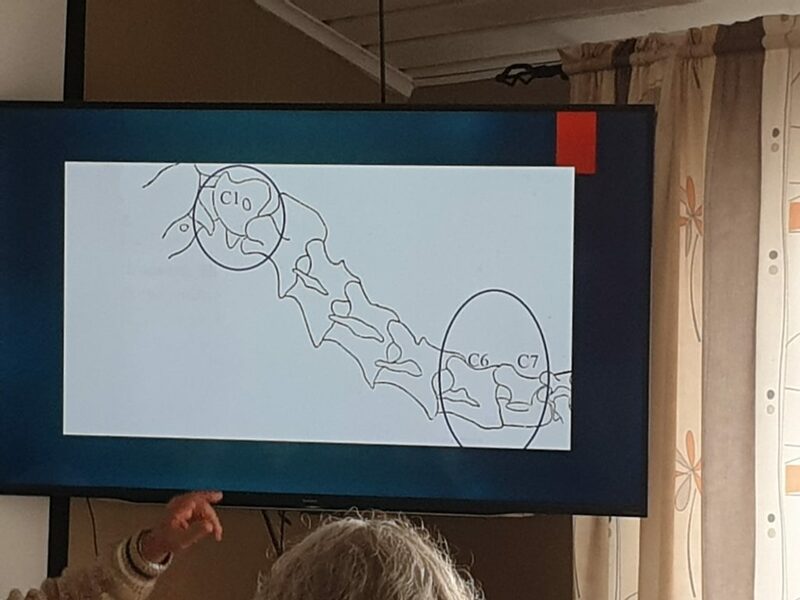 Stephen Levin describes how every part of an organism, from the molecular to the gross anatomy, is integrated by a mechanical system into a complete functional unit. You can never separate a single body part. A change in one part of the body will always influence other parts of the body. To be able to communicate with the horse, the aids are not enough. You need to use your interior body and your balance to be able to communicate with your horse. We can describe the gross lines of the rider’s position, but the seat is not a posture. The seat is a body coordination, proper to each individual. The seat involves the rider’s whole body where numerous nuances in muscle tone occur simultaneously but within an overall integrity. The seat is a conversation guiding the horse mental processing to the body coordination optimally adapted to the athletic demand of the performance. The seat cannot be in balance if it is disturbed by any shift of the rider weight or any lateral and/or transversal shift of the saddle. Forces, such as upward forces, are constantly acting on the rider’s body. There are a lot of forces just in front of the riders seat and just behind the riders seat, acting upward. That might feel like a swinging back, but it is mostly forces created by the horse’s legs and the vertebral column. If the rider relax his back and follow this force, the horse need to protect himself from the movements in the rider. Therefore, the more relaxed the rider is, the more the horse need to tense his back. 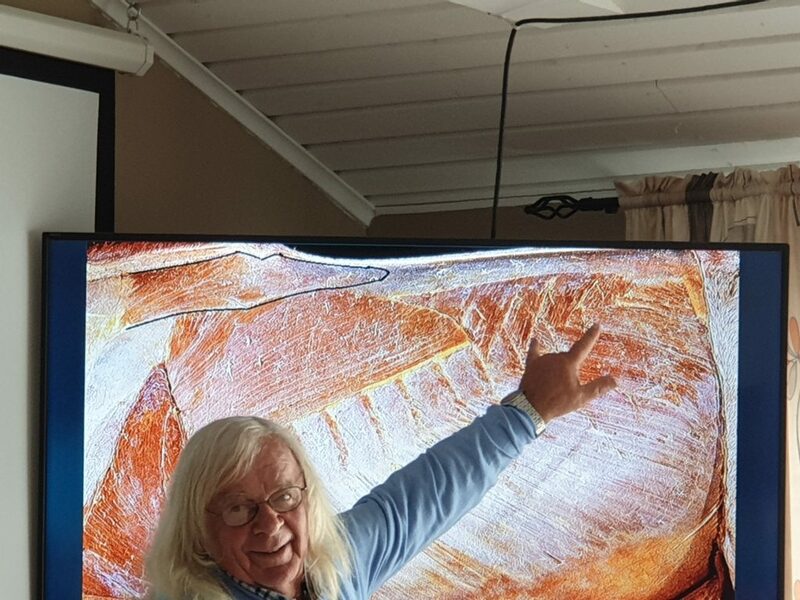 The horse is not lifting its trunk straight upwards. It lifts the trunk with the rotation. This can be a stepwise lift between the left and right side of the horse. 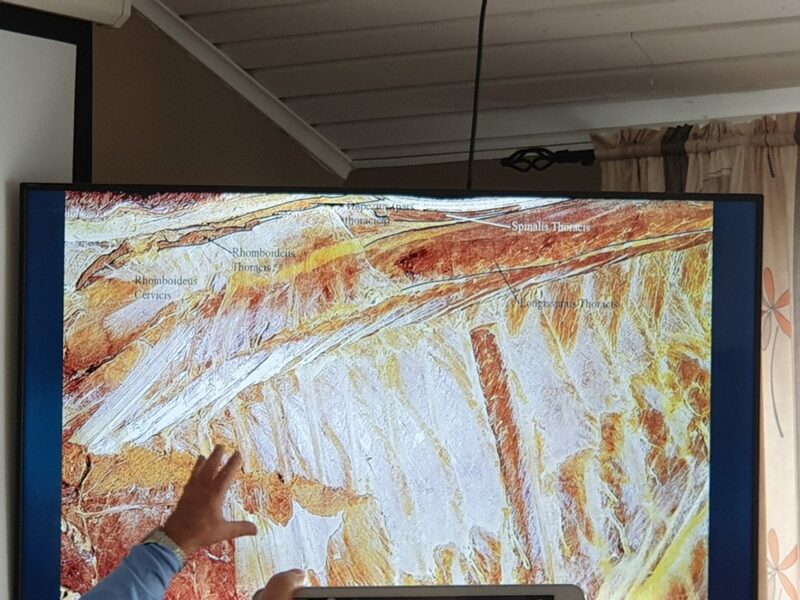 So a tiny rotation to the left will lift the right side of the horse a little, then a tiny rotation to the right will lift the left side of the horse a little and so on. There are two ways to create rotation. By engaging the inside hind leg. Each horse will prefer one of the ways. Always start with the approach that the horse prefer. When it starts to work, use also the other one. 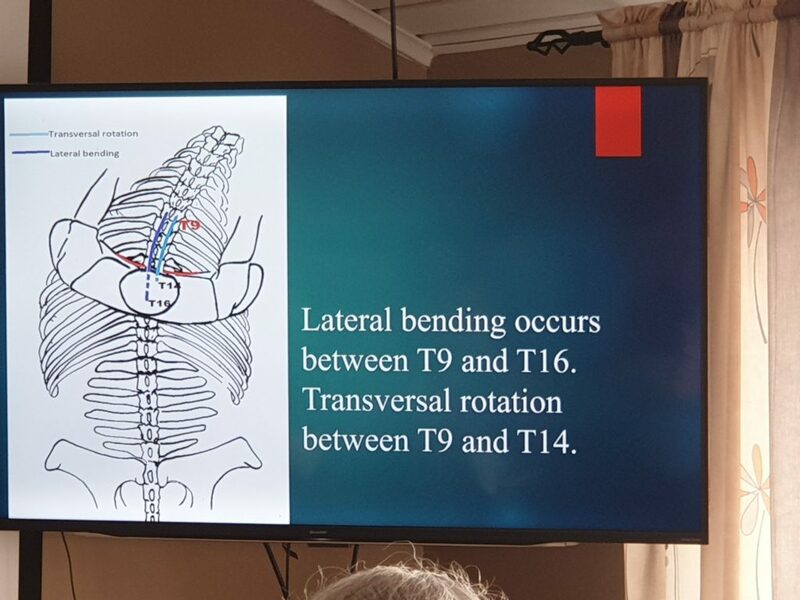 Lateral bending occurs between T9 and T16. Transversal rotation between T9 and T14. Therefore the lateral bending and rotation occur between the rider’s upper thighs. If the rider sit too far back, the horses trunk will not be between the rider’s upper thigh. The integrity of the whole body of the rider is involved. If the rider bends the spine, he will create a force pushing the horse laterally. 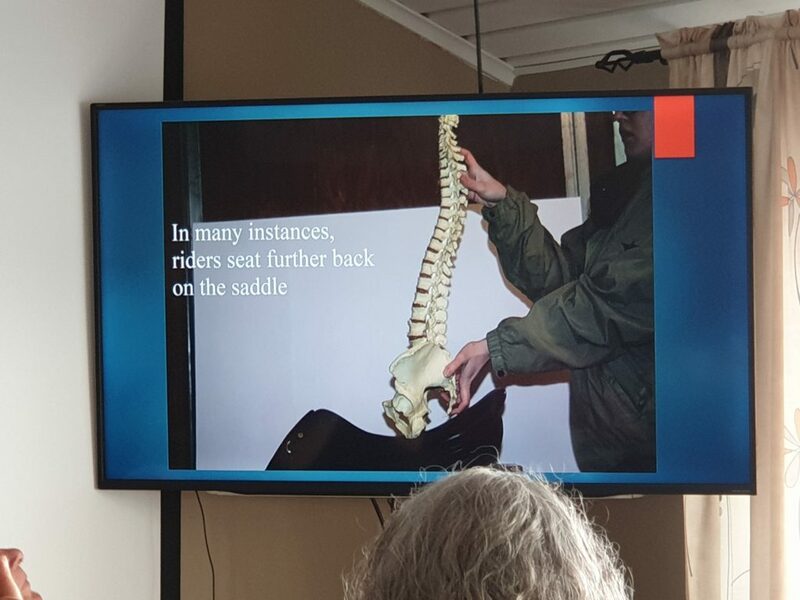 The same problem will occur if the rider compensates for inverted rotation of the horse’s thoracic spine and/or a shift of the saddle by bending the vertebral column. If the spine is twisted, you will never get the right reaction in the horse. Therefore the shoulders, the pelvis, the upper thighs and the arms of the rider need to face in the same direction. If the rider turns the shoulders and/or the head to the right but keeps the pelvis straight, the horse will likely keep going straight. The twist of the rider’s spine will alter the integrity of the rider’s body. The twist of the rider’s upper body to the right will also shift the seat bones toward the left stimulating inverted rotation. 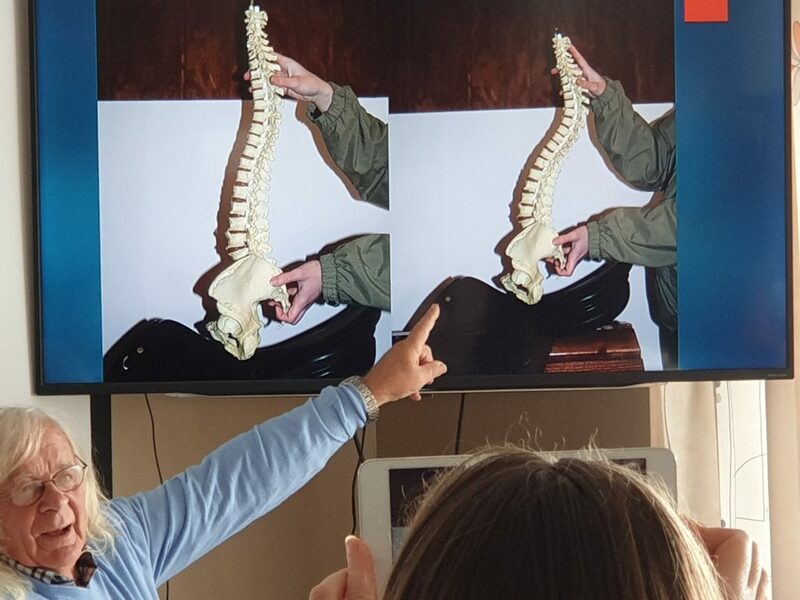 On the picture, inverted rotation is also created by excessive bending of the horse neck. It is the upper thigh that will influence the chest of the horse. The lower thigh will only act on the ribs, and you can not do anything on the ribs. Therefore it is the upper thigh you need to use to create the rotation. Don’t squeeze with the lower thigh. But the calf should always touch the horse. An error that hampers the rider’s integrity and alters the clarity of the conversation with the horse, is squeezing the lower thighs above the knees, moving the lower legs away from steady contact with the horse’s flanks. If the rider squeeze with the lower thigh, this might cause the lumbar spine to arch. Also the contrary can occur, that an excessive arching of the lumbar vertebrae causes the lower thigh to squeeze. The defect tends to move the lower legs away from the horse’s flanks. This creates a problem of instability in an area of very high tactile perception. From this leg position, the rider either has to squeeze the legs, in order to touch intermittently with the calf. In both cases, the horse is disturbed by excessive pressure of the chaotic stimuli of intermittent contact. You need to have contact with your upper thigh and your calf. The stirrups will help you to keep your calf in contact. Don’t press, just let it stay in a constant contact. Squeezing the lower thighs above the knees also alter the accuracy and stability of the rider’s seat. The rider’s body rotates around the knees lifting the seat of the saddle. The rider’s hands are not there to control the horse but to feel the horse’s thoughts. The forearm need to be soft. The tone of the arm need to be very low. Instead, the equitation of the driving seat, rushes the horse on the forehand, increasing the weight on the bit and the rider holds back pulling on the reins. Lightness is not the bit. Lightness rests on the rider’s stability, controlled motion and balance. 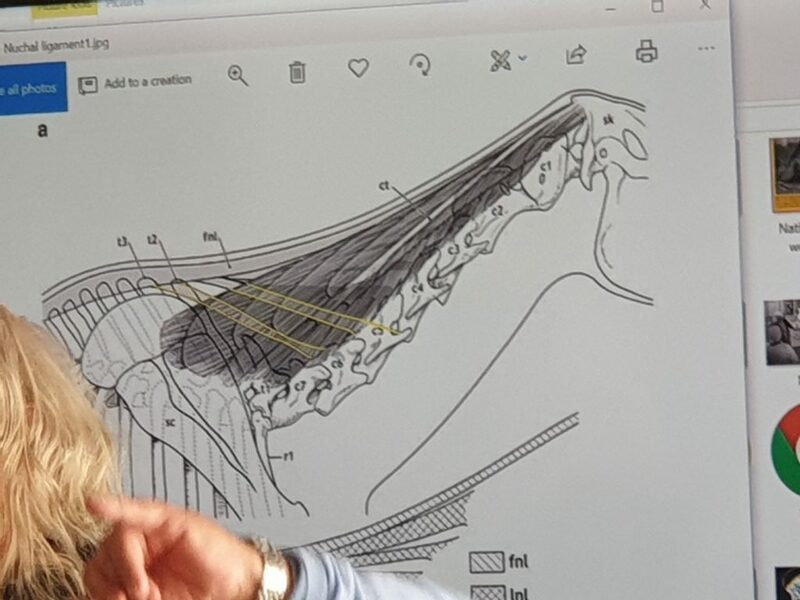 The rider entire muscular system is involved in teaching the horse advanced body control. Only the stability of the seat, abdominal and back muscles, allows the freedom of the shoulders and the softness of the arms, elbow and forearms. The vicious circle: The rider’s seat is driving the horse on the forehand. The horse responds pushing down and forward on the bit. The rider pulls back. The forearms are tense, elbow and arms are contracted and the shoulders are locked. Between the driving seat and the pulling action on the reins, the compression of the facets between C5, C6 and C7 is likely to create damages. The flexion of the poll should actually be created by a lift in the trunk which lifts the base of the neck and push the cervical vertebra forward and the poll get flexed. 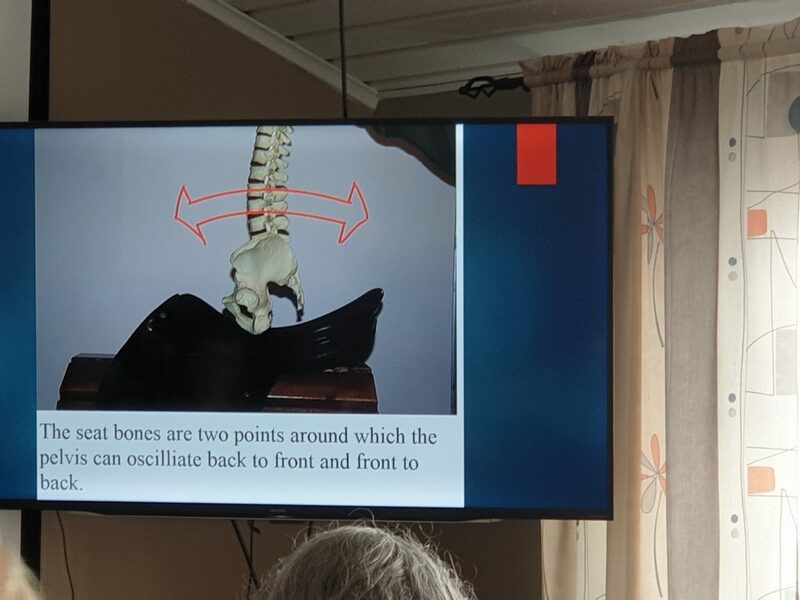 By contrast, if the flexion of the poll is asked at the level of the poll, the flexion will lead to a contraction, which creates a backward force and a restriction in the base of the neck. C6-C7 easily come under stress. The hind legs push forward and the poll restricts backward. That places the C6-C7 under stress. At the picture you see how C6 can become deformed due to this stress. It shows an enlarged facet resulting from abnormal stress. The nuchal ligaments has one structure between C2 and the poll and another structure between C2 and the wither. Therefore the line of function of the nuchal ligament is not from the vertebra to the poll, it is actually from the vertebra to C2. The equestrian literature wrongly advises ”taking contact”. Taking suggests pulling, acting backward the hands moving back or acting backward toward the body. If the horse is pushing toward the hand you might have to resist. But if you act backward you will cut the movement. The hands can eventually stay still or moving forward toward the bit, never toward the rider’s body. Staying still induces the concept of resistance, which must not be a wall, but instead a filter. Elastic stiffness is how muscles work. Elastic but not loose. The equestrian literature uses the wrong terminology to correct the error of the first terminology. Taking equal cutting, and to avoid cutting, the equestrian literature digs deeper in the hole talking about releasing, relaxing, stretching. It is all about permanent tension, tensegrity, with numerous nuances. To be able to do that you need to be still. Advancing the ASIS places the rider in a neutral balance where the body weight is not acting back to front or front to back. Thruness has nothing to do with speed. 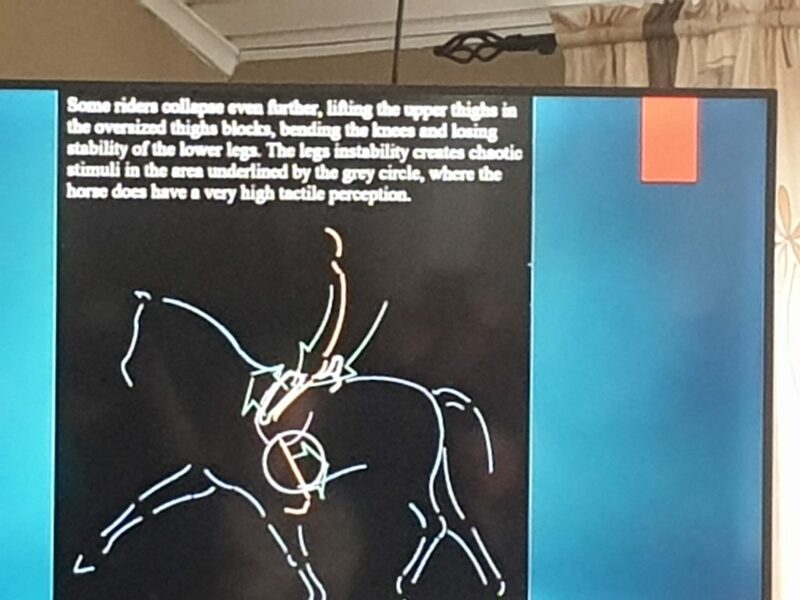 It has to do with how the movements go thru the horse. 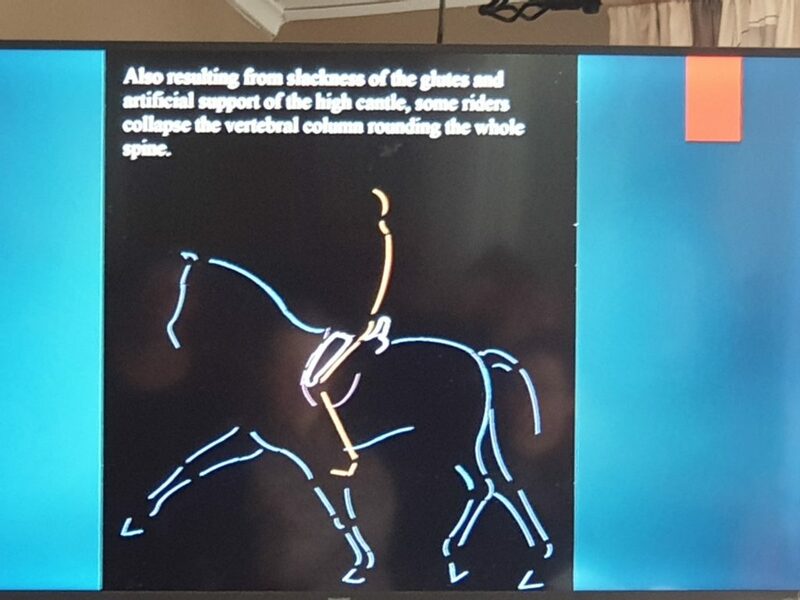 It is the capacity of the horse to properly use the thrust created from the hind legs for balance control, lift, bending and rotation, and convert the thrust it into an upward and a horisontal force. Therefore thruness is about how the horse handels the thrust created by the hind legs with its muscles. If the horse stiffens the back it can no longer use the force and convert it. Therefore the horse is not thru. It the horse is pushing against the bit with the hind legs it is not thru. The bounce is the beginning of forward. Without a bounce you will not have thruness. But the bounce doesn’t mean that the horse is completely thru. When you have a bounce you can start to push the horse more forward. If done properly the thruness will increase. But if the horse speed up from the push, it will get stiff and you will loose the thruness. In the beginning you need to limit the thrust from the hind legs. If the hind legs are pushing too much the horse will not be able to convert all that thrust. Therefore it is easier for the horse to learn this coordination when the hind legs are pushing very little. 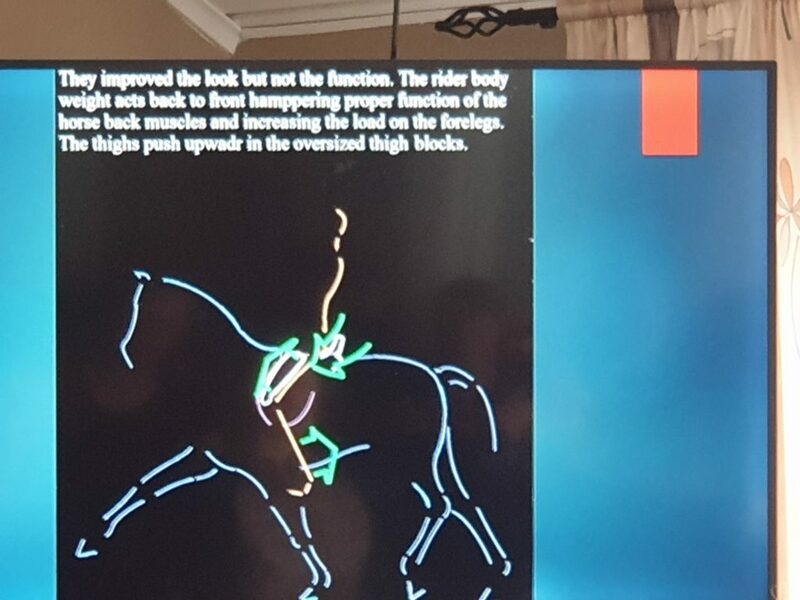 When the horse has learned to convert the thrust, you can increase the push from the hind legs and the thrust, and the horse will still be able to convert it. You need to go slow in the beginning, to learn the proper coordination. But you should not go slow your whole life. You go slow to be able to go fast! In the beginning many horses need a really slow cadens to coordinate. After some time the horse can have a faster cadens and still keep the coordinate. If you go slower than the natural cadens of the horse, the horse need to use more muscle power for the work. You can use that slower cadens to develop the muscular system of the horse. But the horse might get sour in the muscles. When you are in the right cadens, the horse will work effortless. When the cadens is slower, the horse need to use more muscle power for the work. If the cadens is faster, the horse will stiffen. The laminal ligament of the nuchal ligament is strong. It goes the whole way up to C2. Above that there is only a nuchal ligament, which is very weak. On the neck, the nuchal ligament is elastic. On the thoracic it is not. It gradually loose its elasticity the further backwards it goes. From T4 to T9 there can be a verticality of the dorsal spine. When the horse elongate the neck, it is not a stretching. 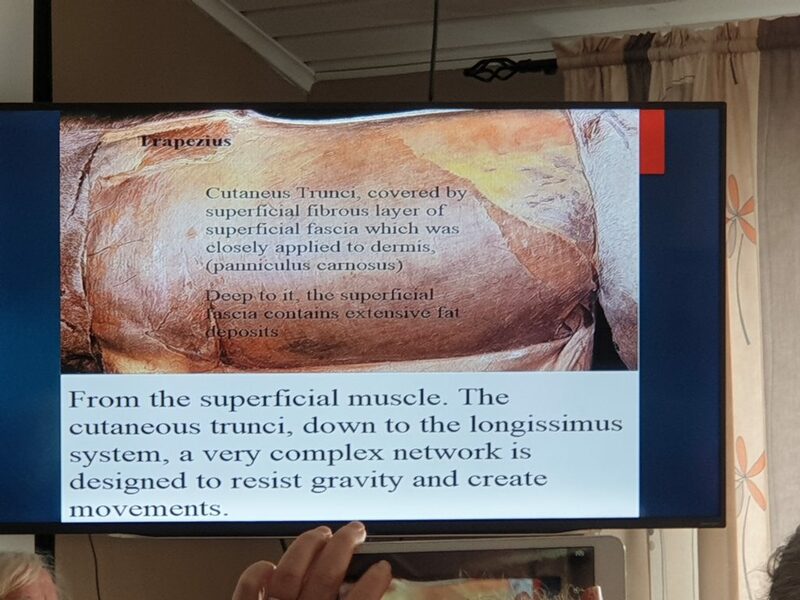 The more the horse lengthen the neck, the more the muscles in the neck (most important Splenius and semispinalis capitis) need to resist the gravitation. The nuchal ligament help the muscles to carry the weight of the head and neck. In walk the nuchal ligament can carry up to 55 percent of the weight. The muscles still carries 45 percent of the neck. That is a resistance and not a stretch. In trot and canter, the nuchal ligament is only carrying 33-37 percent, so then the work from the muscles are bigger. If the trunk is supported by the muscular system (the serratus and pectoral muscles), the lowering of the neck will create an upward force. But if the neck and head is lowered too much, the trunk will go down instead. 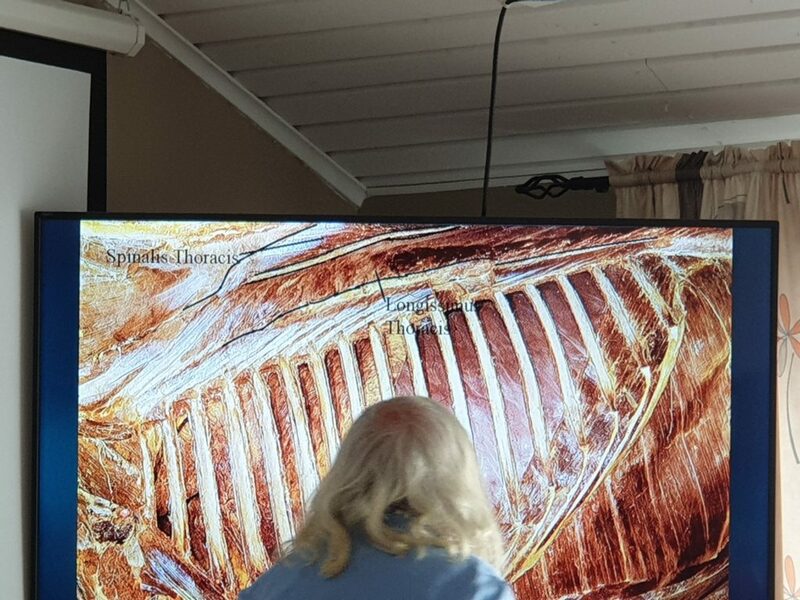 The same happens if the horse lengthen the neck without supporting the muscular system. 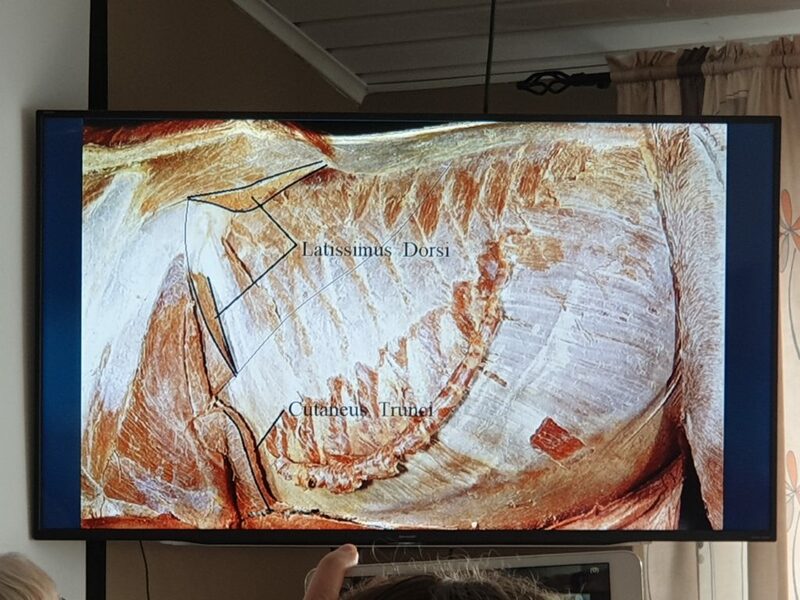 When the horse activate the serratus and pectoral muscles properly, the aponeurosis will work optimally and help the muscles to lift the trunk. Therefore the muscles doesn’t need to work so hard, since the tendons work more. What develops the base of the neck the most is the serratus. The muscles above is only lifted by the serratus. The vet school say that we have an epidemi of arthritis in the cervical vertebra. Depending on hove we place the neck, there will be stress on the neck and on the cervical vertebras and the attachment of the muscles. The force goes thru the thoracic spine into the cervical spine. The scalinus should keep the vertebras in line. If the scalinus is weak, the force will instead push the cervical spine to the left or to the right. When you have contact on the bit you will always have one force going forward into this junction and one force going backward. If they are not completely aligned, they will be pushed to the side. When the horse bend the outside shoulder need to move forward. If the outside shoulder moves backward, you have a restriction. The lift in the outside shoulder comes from the rotation. But when the rotation is correct, it is very little. Therefore the lift in the outside shoulder is almost nothing. When the outside shoulder goes backward, it can be because the thoracic is bent the other way. When the horse has an inverted rotation, the outside shoulder might be both lowered and backward. 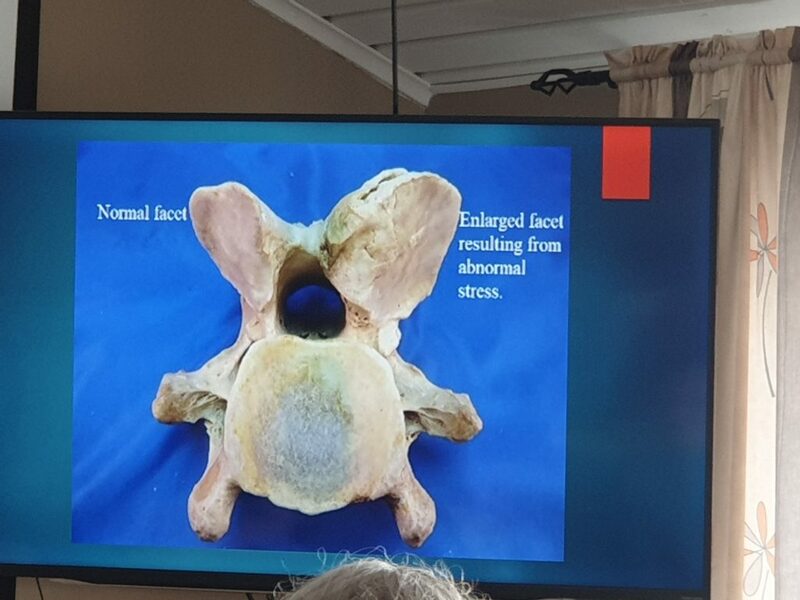 There is cartilage on the pelvic and cartilage on the sacrum. The force from the hind legs need to go thru this joint. Due to the cartilage, the force can go in different direction. There are several strong ligaments stabilising the sacroiliac joint. The movement is very little, 0,8 degrees. But that small movement is important to make it possible to transmit the movement from the force from the hind legs. If the force doesn’t go thru, the force comes back to the joint that become under stress. The reason can be a blockage of the force in another place of the horse. How do we fix it? You can not manipulate the Sacroiliac joint. Instead you need to find the reason for the stress. It can be overflexing, wrong rotation of the spine or something else. If the spine is not in line, there will be stress on the sacroiliac joint. When the bone is under stress, the bone build more surface. The bone in the sacroiliac joint will also build more surface. That is how the sacroiliac joint will try to absorb the problem or pain. If you find what’s wrong in the movement, you will reduce the stress on the sacroiliac joint. There is both a breaking phase and a pushing phase in each stride. During the breaking phase the horse resist both gravity and speed. During the breaking phase the legs store elastic energy. During the pushing phase, the elastic energy is lifting both the forehand and the hindquarter of the horse. The muscles slow down the structure of the knee just before impact, to protect the knee from too much stress.